Daniel Sangjib Min/TIMES-DISPATCH Brenda Kenney (left) and Chimere Miles are members of the Engaging Richmond team. Kenney lives in Whitcomb Court and recruited women to participate in focus groups on East End needs. There is sometimes tension when people in struggling communities and those who want to help differ on what the problems are and how to fix them. “These people need to be like us” can sometimes be the subtext of well-intended efforts. “You have all of the service providers. They are on the outside looking in,” said Brenda Kenney, who lives in the Whitcomb Court public housing project in Richmond’s East End. Kenney, a mother of two young adult children in college and three younger children, ages 15, 12 and 9, is part of an initiative called Engaging Richmond, a grant-funded university-community partnership that asks residents to help identify the issues that most profoundly affect health in the community, and then develop solutions. The Center on Human Needs at Virginia Commonwealth University and the George Mason University Center for Social Science Research are the university partners. Community partners are the Richmond Promise Neighborhood project and other service providers in the East End. 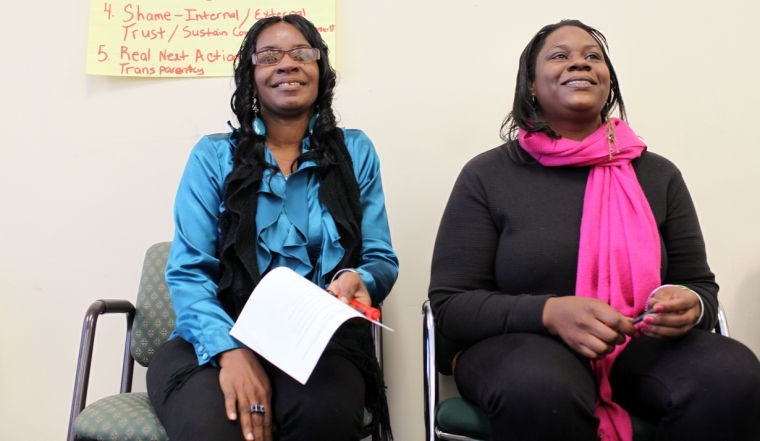 The Engaging Richmond team started working together in December 2011, and in about six months conducted 17 focus groups with more than 170 participants, including people who live in public housing, service providers and others who live in nearby neighborhoods. “The East End has a pretty strong network of people who are working in that area,” said Albert R. Walker III of the VCU Center on Human Needs, explaining why the team chose the East End for its focus. Walker is the former manager of the nonprofit Charity Family Life, which closed in 2011 after years of providing free academic tutoring and mentoring to children in public housing. “Richmond Promise Neighborhood at the time was looking for someone to do their needs assessment,” he said. The Engaging Richmond team, with close to half its 16 members living in the East End, was able to help with that assessment and at the same time link with an organization that already had ties to the community for its own research. The team of residents and researchers went into communities and asked people to talk. Kenney had been involved with an informal women’s discussion group called Women of Worth that started in the Whitcomb Resource Center. She recruited some of the women from that group for the focus groups. Walker said he still gets goose bumps recalling the sense of empowerment in an Engaging Team member who lives in public housing who researched the history of public housing and for the first time understood how things came to be that way. That team member has attended city meetings to voice her concerns about proposals for redevelopment. Overall, the team identified three priorities: parental involvement, workforce development, and mental health and well-being. “While there are others, these are the ones we felt, according to the data, were the most pressing,” Walker said. The digital divide was one thing that emerged as a workforce issue, indirectly affecting health. “Having access to the Internet, being able to use technology to apply for jobs. That was a huge barrier. Indirectly it affects health outcomes because people aren’t able to take care of their families like they want to. The lack of jobs, quality kinds of jobs, affects their mental well-being,” Walker said. The team met recently to talk about moving from research and data collection to action. Kenney, preparing for that meeting, thought about what message they needed to get across. “Just because you are living in low-income housing does not mean you are not supposed to be healthy,” she said. Her neighbors, she said, are struggling.